The standard polo occupies a very important space in every man's closet: it's not too casual and not too dressy. You can throw one on with a pair of jeans and sneakers just as easily as you can dress it up with a pair of chinos and a blazer. And you'd look sharp and put together with either getup. What's the long-sleeve equivalent of a polo, though? As the weather gets colder, what's a guy to wear to fill the "not too casual; not too dressy" void? Some might suggest a henley, but that definitely leans far more casual than a polo does. Other than that, there are really not many options. Except, of course, for the long-sleeve polo. The trouble is that these things have always been considered strange-looking, or even nerdy. They really do not have to be though! For one, many companies make really nice-looking rugby's, which are basically just more sporty long sleeve polos, usually with a thicker collar and button placket. (Suggestions: J Crew, Land's End) However, many people don't love the more sport-like style of these, or all the colors or other flair. While I think there is certainly a place for the rugby in every guy's wardrobe, I certainly do understand that they are not everyone's cup of tea. These days, though, a few brands have started offering truly upgraded long sleeve polos, with style details like real, dress-shirt-button-down collars, button cuffs, and other details and fabrics that make these long sleeve polos look absolutely killer. 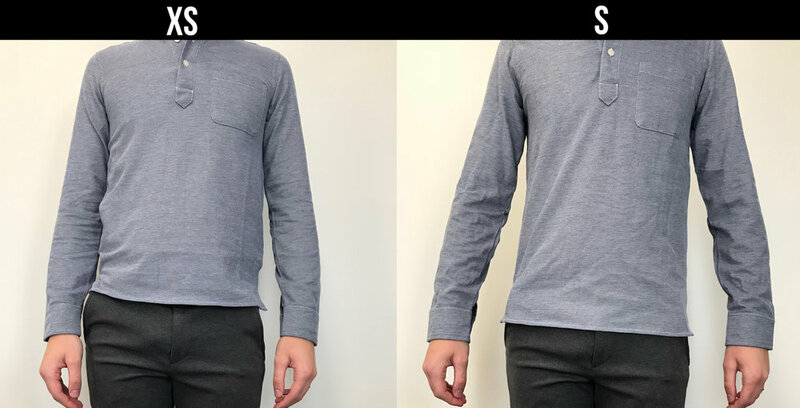 If you were on the fence about long sleeve polos before, this new breed of them should make it absolutely clear how awesome they are. You can wear these just plain, or throw a blazer on over them and head out to dinner. They're that versatile, good-looking, and comfortable. For some time now there has been quite a lot of hype around Jomers, a new and unique clothing company promising to offer truly quality menswear products at reasonable prices (by, you guessed it, cutting out the middle man) via timed "drops" of clothing items in limited quantities. This was my first experience with Jomers, and while the standard packing envelope it came in was nothing special (guess you gotta cut costs somewhere), the actual garment itself truly felt like something of much higher quality than your typical Banana Republic or J Crew shirt. The fabric felt thick, luxurious, rich and textured, yet soft and comfortable, and, again, not at all something you would find at your usual big-box retailers. This felt like something truly high-quality or even designer. The material is 100% cotton and it is made in Peru. If I could sum up this section of the review in one word: impressive. The styling and details of this polo are, also in one word, perfect. The fabric choice is fantastic, and I love the color. The button placket is perfectly deep enough, and the pocket adds visual interest and makes it more unique. Then there is the button down collar which is a wonderful and thick collar that stands firm. And then there are the button cuffs which I love as a detail on long sleeve polos as it makes it just a tad dressier, slicker, and closer to a regular dress shirt. The bottom hem is also split at the sides like a typical polo. In short, these things are just plain cool and unique. As far as looks are concerned in regards to a long sleeve polo, Jomers positively nailed it here. Here is where things go south. I do not know what happened here, or what sort of models Jomers uses to test their sizing, but this thing fit unlike anything I have ever tried before. I ordered my usual size S (I am 6'1 and 160 lbs.) and it fit like a trash bag on me, and was way too long. The cuffs were also enormous — I could have fit two of my wrists in it. I then ordered an XS just to see if maybe I simply needed to size down in the brand, but the XS was, not shockingly, much to small and short on me, and pulled uncomfortably across my chest. Of course, as with any clothing, it's going to fit everyone differently, but if you're slim guy, you are very likely going to have some trouble with this. Which is such a pity, because I really, really wanted one of these in my closet... In the end, I had to return them both. Speaking of returns, be aware that you are on the hook for returns, entirely. They do not provide a shipping label, and require you to go to your local post office and ship it back to them to their address, which ends up costing quite a few bucks. A bit annoying, and in the new age of online shopping, free returns is really a must. I understand they need to cut costs somewhere, but this is still something I would like to see them change at some point soon. At $30.00 this polo is a great value. The quality is well beyond that price, in my opinion, and if it will fit you, this is the nicest long sleeve polo I have seen this season. Look, the hype around Jomers is warranted. In terms of the quality they promise at their extremely reasonable (but not cheap) prices, they absolutely deliver. Fit, though, is a part of quality in many ways, and if your product fits so dissimilarly to the rest of the market I think that it's a major flaw. Maybe they just also need a slim option? I don't know the exact solution, but I do think a solution is needed. If I could get a slimmer one it might just be one of my favorite items in my closet. As it stands, it is instead inside of an envelope heading back to Jomers.